It’s pointless to debate who has given the best performance as 007; yes, Sean Connery was brilliant, we’re all well aware of that, and people will debate forever whether Connery or Craig is the best Bond. I say, how can you compare the two? They aren’t playing the same character. Connery epitomizes the classic ‘screen’ version of 007, but the movies have never portrayed Bond the way Ian Fleming wrote him. And in Quantum of Solace, the director Marc Forster and his team have unleashed Bond upon the digital age, the age of terrorism and mega-corporations and corruption at every level. They hinted at this world in Casino Royale, and Quantum is that world fully realized. It’s a world where Bond, classically portrayed as someone always a few steps ahead of the villains, is barely able to keep up. And this time, he’s motivated by the death of the only women he has (or likely will) ever truly loved. 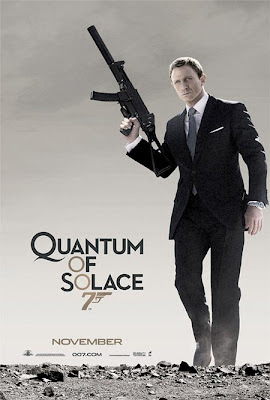 In a bold move that firmly establishes the Criag-era as a total re-invention of the series, Quantum of Solace is a direct sequel, picking up an hour or so after the end of Casino Royale, with Bond transporting Mr. White to an underground interrogation chamber. Mr. White reveals that he is part of a huge organization that has people everywhere…literally. Think SMERSH or SPECTRE to the nth degree. Bond begins to investigate the organization, apparently seeking retribution for the death of Vesper Lynd, and killing anyone who stands in his way, attracting negative attention from M and MI6. Quantum works on so many levels, and I’ll discuss that, but first let me get one thing out of the way. No, it’s not as good as Casino Royale. That film was an instant classic, and Quantum doesn’t reach that height. How could it? Quantum is simply a terrific sequel, one that feels more like Part 2 of Casino Royale than its own stand-alone entry, and that’s actually quite fun to see. I’d recommend viewing Casino Royale shortly before heading to the theater for Quantum of Solace, because the two go hand in hand. As I said, the film works on many levels. The first thing most viewers will notice is the action, which isn’t in shortage in this film. The movie opens with a car chase. Not dialogue and then a car chase, but literally a car chase: the first shot is of an Aston Martin speeding through traffic. It’s a helluva a way to open a movie, and it’s just one of the many set pieces to come. After the opening credits and an interrogation, there’s a terrific foot chase ending in a creative scenario involving Bond and a villain hanging on ropes grappling for dropped guns. Director Marc Forster makes us of the ground, the sky, the water, and fire for the action sequences, making for a veritable smorgasbord of excitement. Some critics have compared the level of action to that of the Bourne films, but in all honesty, those critics are full of it. The Bourne films (which I also love) feature an action set-piece every five minutes, while Quantum consists mostly of investigation scenes, like any James Bond film. There’s more action than in any other 007 adventure, but it is spread out, making it all the more awesome when the gunfire begins. Forster has captured a great balance of plot, emotion, character development, and action. Given his track record (Forster directed Finding Neverland and The Kite Runner,) we can expect those first three things. It’s the action that’s so impressive, because Forster has never directed anything that used more than a tiny budget. His action sequences are all terrific; they don’t quite match the quality of some action scenes in the Martin Campbell Bond films, but Forster comes in a close second, impressive for an Indie filmmaker. The bonus of using Forster is the emotion he brings out of the characters. This is a director who knows emotion, knows character, and he uses that expertise in Quantum. At its heart, this is a film about inner-turmoil. On the surface, it appears as though Bond simply wants revenge, but an astute viewer will realize that vengeance is not his goal. He simply wants to understand what has happened to him, to come to peace with the events of the last film, to find his quantum of solace. The best scenes in the film are not the action set pieces, but the small, heartfelt moments where Bond will sip a martini and look longingly at a picture of Vesper. The film features a good mystery too; villain Dominic Greene doesn’t seem sinister at first, but as Bond slowly discovers his plan (which doesn’t involve destroying anything but is pretty villainous just the same), we realize how intelligent and formidable an enemy he really is. Unlike Casino Royale, we don’t learn the villain’s plan until near the end, which adds to the tension. None of this could be achieved without a top-notch cast, and Quantum features a great one. Not enough can ever be said about Daniel Craig. From his first moment on screen in Casino Royale, he had the role down pat. He is, in my opinion, the best actor to take the role (though, as noted earlier, there is a certain futility in comparing the actors) and he proves it in Quantum. He can be one of cinema’s most badass action heroes in one second and be a conflicted human the next. He’s incredibly comfortable in the role, and is the main reason both Casino and Quantum work so well. Mathieu Amalric plays villain Dominic Greene, and does a terrific job. He is the rare Bond villain that lakes a deformity, but Amalric’s facial expressions and mannerisms are creepy enough. Olga Kurylenko is an untraditional Bond girl in the sense that she never goes to bed with James; she’s his sidekick, also on a revenge vendetta. Kurylenko is excellent in the role. I also enjoyed Gemma Arterton’s performance as MI6 desk agent Strawberry Fields (ha-ha…), who is a traditional Bond girl in the sense that she does in fact sleep with James. The returning cast (which I believe consists of the largest number of actors to appear in more than one film) is absolutely fantastic. Judi Dench is a perfect M, and she has far more screen time than she has before. As in Casino Royale, she acts as a sort of mentor and critic of Bond; her struggle in the film is whether to trust the rogue agent or not, and it’s a very compelling story. Giancarlo Giannini returns as Rene Mathis, Bond’s ally from Montenegro, bitter about his false arrest, but who puts the past behind him to help Bond. He’s quite good in the role and his character adds a lot to the role. Jeffrey Wright is a great Felix Leiter—the best actor to play the role so far, and I hope his screen time is expanded next time around. David Arnold’s musical score is again excellent, if not as compelling as past Bond scores. My only complaint about the music this time around is the almost total lack of the Bond theme. I thought they introduced it at the end of Casino Royale so that we’d hear it throughout the next film. It makes a few brief appearances, but doesn’t return in full glory until the credits, where it sounds like stock music from the last movie. Oh well. Quantum of Solace isn’t perfect; the ending does tie everything together and leaves the door open to the next sequel, but the resolution doesn’t feel as satisfying as in prior Bond films. They also neglect a perfect opportunity to use the line “The name’s Bond…James Bond.” Still, this is a great entry in the series that works as an action film, a character study, and a darn good mystery. I can’t wait to see what the team does next, because with the way they’ve reinvented the character, and with the legendary performance of Daniel Craig (somebody give this guy a major award), this is a rebooted franchise that can continue for years. And for the record, I actually do like the title. A lot. One of my favorite ones in fact. But I will admit that the theme song for Quantum of Solace (“Another Way to Die” by Jack White and Alicia Keys) is awful.